What you need to know about high efficiency cooling - RJ Kuhn, Inc.
Everybody is aware that some cooling systems will produce the same amount of cooling as that of other systems but at a lower energy cost; these units are considered high efficiency. There are several factors that contribute to this higher efficiency, some very obvious, some a bit more discrete. The first thing to consider is what a cooling system actually does; so many people believe that they are adding cooling to their homes. In fact, a cooling system does nothing more then remove heat from your home. It not only removes the heat that we can measure with a thermometer (sensible heat) it also removes the heat that is contained in moisture or humidity (latent heat). It is easy to understand how latent heat is removed, simply by lowering the temperature of the air, moisture is removed from the air. This is the same concept as why we get a morning dew, the temperature of the air has lowered in the evening hours, and therefore the air must give up the moisture since cool air cannot carry the same quantity of moisture that warm air can carry. The sensible heat removal is done through the refrigerant, it uses the physics principle that cold objects will absorb the heat of surrounding objects that are warmer. In other words, if you get your evaporator coil cold with refrigerant and then your blower moves the warm air from your house across the cold coil, the heat from the air will transfer into the refrigerant in the coil. As this refrigerant absorbs the heat, the refrigerant will flow to the outside coil where the condenser fan pulls air across the condenser coil thus relieving the heat from that coil to the outdoor air. So your cooling system does nothing but transfer the heat from your house to the outside, just the way your refrigerator will disperse the heat from inside the box to your home and you can feel this heat come out the bottom across the floor. Knowing this principle will help understand efficiency. If the coils are larger and have more surface area, the heat is therefore less concentrated and will disperse the heat more effectively. So larger coils will help transfer heat more efficiently. Additionally, a larger coil with a larger surface area will move air more efficiently making your blower motor work less. The less work that the blower motor must perform, the less energy it will consume. This also applies to the outdoor coil, a large coil will have less restrictions and will allow for the condenser fan motor to actually be down sized. A smaller motor draws less power. The final thing to consider is the type of blower motor that you are using. The more efficient motors are one that have a DC invertor which allow the motor to operate on direct current voltage. The advantage of direct current is the motor will run more efficiently. Motors that run from the 120 volt current in your home (AC or alternating current) use that energy to produce work at the motor shaft to turn the blower, but also consume energy that develops heat in the motor. These motors can actually be hot to touch after running for a period of time even though they have the cool air from your home constantly moving across them. So not only does the motor waste energy in producing heat at the motor, that same heat must be removed by your cooling system which means that the system must not only remove heat that is currently in your home, it must also remove the heat that is being generated by the blower motor. Understanding the efficiency of a motor using an inverter to operate from direct current will help explain why a cooling system with an advertised rating of 16 SEER may not get that rating with your existing furnace. If your furnace is using a motor that operates without a direct current inverter, the inefficiencies of your blower motor will lower the overall operating efficiency of the cooling system. The ratings today take into account the efficiencies that the inverter direct current motors achieve. With the laws changing in 2019 and forcing manufacturers to produce furnaces with only motors using inverters to operate on direct current; manufacturers have only had their high efficiency units tested in conjunction with a furnace that has a direct current motor. This is mainly due to the high cost to get an AHRI rating and they see no reason to perform tests on units that will be obsolete in less than 1 year. At RJ Kuhn, we not only explain to the residents of Oswego, IL. 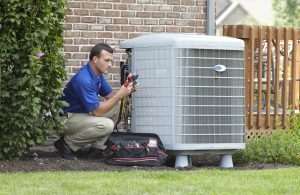 why a unit achieves higher levels of efficiency, but we will also help you understand the benefits of high efficiency. Even though you may be comfortable with today’s cost of energy, one thing you must always remember, the unit you select and pay for today if most likely the same unit you will be operating in 15 years. If the cost of electric only raises 1.5% per year; you will be paying 22-1/2% higher in 15 years.